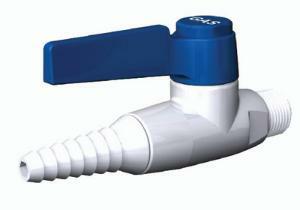 White epoxy-coated single laboratory ball valve with integral straight serrated hose end. Certifications: Meets ANSI Z21.15 standard and is AGA/CGA certified. Ordering information: Please specify service when ordering.